These fundraisers make it possible for CPYHA to keep its fees low while providing competitive programs. 1. 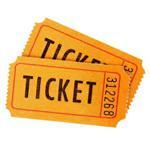 Receive 10 Raffle Tickets (per player) and sell them for $10 a piece or keep them for yourself. If you select the box at registration to receive tickets and decide not to sell/keep them, you will be charged $100 (per player) for registration. For Traveling players, this will be added to your ice bill. For House players, you will be billed. 2. Buyout for $100 (per player). You will be charged $100 at checkout and WILL NOT receive tickets. IMPORTANT NOTE: Whether you purchase the Raffle Tickets or chose the Buyout option, the cost is $100 (per player). Purchasing/selling them gives you the opportunity to reduce your fundraising fees and/or win $! You will have approximately 5 weeks to sell your raffle tickets. Winners will be posted online at www.cpyha.com/winners. Tickets will be distributed October/November (Date TBD). Traveling players will be issued tickets through their team manager. House players will pick up tickets during the mandatory parent meetings on 10/10 and 10/11. No additional ticket sales will be allowed as in previous years.